Kamal Nath edges out Jyotiraditya Scindia as Congress goes for experience ahead of the 2019 Lok Sabha elections. 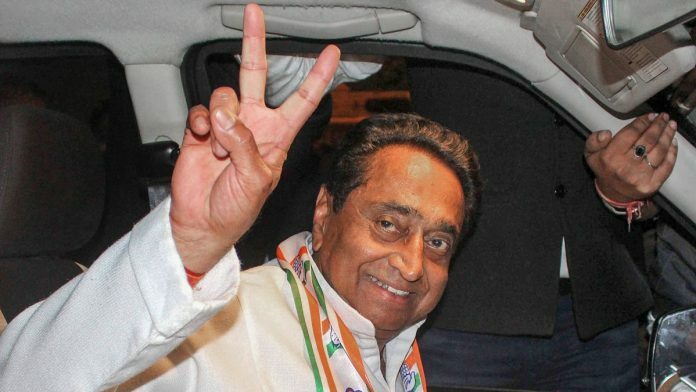 New Delhi/Bhopal: The Congress settled for its “old guard” in Madhya Pradesh, naming senior leader Kamal Nath as its chief ministerial candidate for the state late Thursday. The announcement ended a two-day long suspense that began after results were announced on 11 December. The other major contender for the top post in the state was senior leader Jyotiraditya Scindia. Nath’s candidature was finalised after a series of hectic meetings that Congress president Rahul Gandhi held in Delhi Thursday. Gandhi held one-on-one meetings with both Nath and Scindia. He also consulted his mother, UPA chairperson Sonia Gandhi, and sister Priyanka Vadra. He even took the help of the party’s Shakti platform, an internal digital platform through which he sent out “personalised” audio messages to lakhs of party workers seeking their response. The state unit of Madhya Pradesh was also consulted, with Gandhi holding an intensive discussion with the state MLAs. The Congress finally announced Nath’s name at its state headquarters in Bhopal. Having decided on who will lead it, the Congress has to now prove its majority. With 114 out of 230 seats, the party is two short of the majority but the Congress has claimed the support of Mayawati’s Bahujan Samaj Party and other independent legislators. The entire exercise of selecting the chief ministers brought to fore the internal factionalism and restarted the debate between the old and young guards in the Congress’ Madhya Pradesh unit. In Madhya Pradesh, the party took its time in deciding between Nath, who heads the Pradesh Congress, and Scindia, who led the election campaign. Even as back-to-back meetings were held at the Congress president’s residence to end the stalemate, the atmosphere in party headquarters in Bhopal turned tense. Supporters of both leaders even entered into a scuffle. Nath’s name was also being dragged into his alleged role as a mob instigator during the 1984 anti-Sikh riots, but Congress leaders dismissed these accusations. Nath, 72, who is a veteran Congress leader, will become the 18th chief minister of the state. An alumnus of the Doon School in Dehradun, Nath’s political career owes a great deal to his schooling days — particularly to a friendship from back then. “Kamal Nath was a close friend of Indira Gandhi’s son Sanjay Gandhi since his school days,” journalist Rasheed Kidwai had told ThePrint. In choosing Nath as the CM for Madhya Pradesh the party has tilted in favour of experience keeping the crucial 2019 Lok Sabha polls in mind. According to a senior Congress leader, Nath was the first choice as he enjoys not only the support of the party MLAs but also of veterans such as former chief minister Digvijay Singh. Nath and Scindia had both played a crucial role in the Madhya Pradesh victory, especially in the backdrop of in-fighting reports.